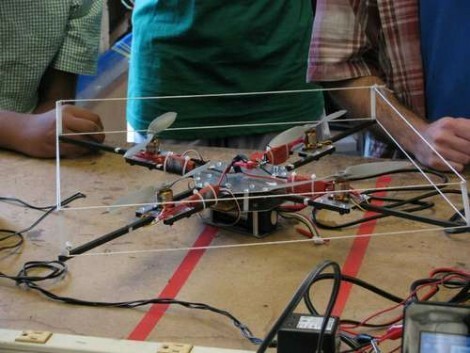 Here’s a great tutorial on building your own quadrotor helicopter. This build isn’t necessarily less expensive than others we’ve seen since quality motors, propellers, and control circuitry aren’t cheap. But the design and assembly is well documented and presents a well-planned building procedure. The carbon-fiber tubes that make up the frame have extensions to protect the motors and propellers in the event of a crash. The Arduino, IMU, and transceiver are all tucked away between two aluminum body plates as well. They only thing missing is a solid methodology for tuning the four motors, a critical procedure that is just touched up at the end of the article. % /. “touched up” -> “touched on” ? Wouldn’t the Perspex case effect the air flow considerably? It’s carbon fiber tubes, not perspex. Using ducted fans and dispensing with the odd square “cage” would make for more payload capacity. Also, if you can live with round tube instead of square, find a nearby store that sells archery equipment and raid their dumpster. I’ve gotten literally hundreds of linear feet of ca. 1/4″ dia. aluminum and graphite arrow shafts for free! With DC motors, can’t you just read the spin right right off the electrical feed? If that’s the case, you should be able to vary the voltage based on that to tune them all for perfectly matched rotation, or even add a tiny gyroscope like in the ipod touch and use that data to make the thing auto-level. The issue is that standard DC motors don’t have the power or efficiency needed to lift the quadcopter. So, quadcopters use brushless motors, which require special controllers. Most, if not all, quadcopter builds do include a gyroscope, which automatically levels it. Without this, most people would crash fairly quickly. I think the idea of calibrating is to make sure the program doesn’t over-compensate for steering and other adjustments. Very best of luck on the project. It is really quite cool! Use CD/DVD-ROM brushless motors. Some of them include hall sensors under the coils. If your brushless motor doesn’t have hall sensors, you can still estimate its speed by quickly measuring the voltage drop around phase terminals. The induced magnetic field is enough for this. This is how some CD/DVD-ROMs uC do also. This thread is worthless without videos. this isn’t really a helicopter, strictly speaking, since it uses propellers rather than airfoils to provide lift. or am i off-base? i wish this wasnt done via instructables. other than that i admire people that can make something out of anything and make it work. great job. Argh! Video clip not found!